President Donald Trump evaluated Tuesday the prospects of the Senate passing the Republican's long-desired tax overhaul, predicting a victory for the Republican-backed Senate bill and lambasting Democrats for being "all talk." Trump's comments came at the White House Tuesday afternoon, shortly after the Senate Budget Committee narrowly approved the tax plan along party lines, sending the bill to the Senate floor for a full vote. Two Republican senators have already voiced their opposition to the plan, meaning just one more GOP senator could prevent its passage should the full bloc of Democrats and independents vote against it. One of the announced Republicans "no" votes, Sen. Ron Johnson, R-Wis., voted "yes" to move the bill out of committee Tuesday, a sign that he could ultimately change his position on the matter. A full Senate vote on the bill could come as early as Thursday. Several Republican senators faced protesters shouting "shame" and "kill the bill" following the budget committee's vote Tuesday afternoon, forcing them to shout as they answered questions from reporters at the Capitol. "I think this bill helps middle-class Americans and the last time anything in Washington, D.C., did anything for ordinary people was, like, never," said Sen. John Kennedy, R-La., who added that he believed a Congressional Budget Office analysis released Sunday that projected negative economic effects for such taxpayers was "lying." Sen. Lindsay Graham, R-S.C., expressed a similar sentiment, saying that he believes the protesters and those in the middle class who think their taxes will rise "to be wrong." "It won't be what I say, it will be how it affects them," Graham said. "If this bill works the way I think, all these loud people will have proven to be loud and I will have proven to be right. If it doesn't do what I think it will do then we will lose." Trump spent part of the day at the Capitol lobbying Senate Republicans for their support on the overhaul. He made no public comments while at the Capitol but gave reporters a thumbs-up when asked if he could deliver on tax reform, long a major item on the Republican agenda. 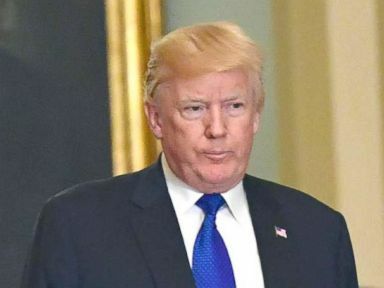 The president earlier criticized Democratic congressional leaders ahead of a planned White House meeting to address government funding, leading to Senate and House Minority Leaders Chuck Schumer, D-N.Y., and Nancy Pelosi, D-Calif., pulling out of the meeting. As he spoke to reporters, the president sat in between two empty chairs intended for Schumer and Pelosi. President Donald Trump, walks with Sen. John Barrasso, left, and Senate Majority Leader Mitch McConnell, right, as he arrives on Capitol Hill in Washington, Nov. 28, 2017. "Problem is [Schumer and Pelosi] want illegal immigrants flooding into our Country unchecked, are weak on Crime and want to substantially RAISE Taxes," wrote Trump on Twitter Tuesday morning, before repeating the sentiment at the White House. "I don’t see a deal!" As for the prospect of a government shutdown if an agreement on funding can't be reached, Trump said that if it happens he will "absolutely blame the Democrats." Schumer and Pelosi characterized the scheduled summit with the president as a "show meeting" in a statement explaining their decision not to attend. The Senate Republican tax plan includes a winnowing of the number of tax brackets, a reduction of the corporate tax rate and an elimination of certain deductions and the individual health care mandate, among other changes. Democrats have argued the plan unfairly benefits high-income earners, disproportionately harming middle and lower class taxpayers. Trump told Republicans at the Capitol Tuesday that he would continue a $10,000 tax deduction for property taxes -- language that is included in the House's version of the bill and a sticking point for some undecided senators such as Sen. Susan Collins, R-Maine. who addressed the overture while speaking to reporters. “I think they’re eager to help me get to 'yes,'" she said.